Watch Full Movies on YouTube for Free! Looking for a movie to watch? 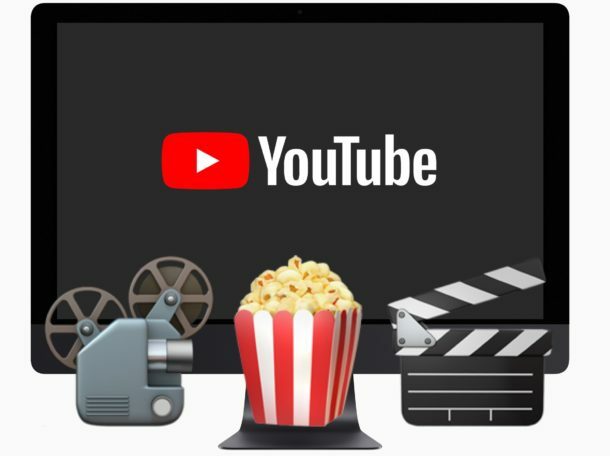 YouTube is putting together a movie streaming service and now offers a selection of free movies to watch online in any web browser or YouTube app. There are a variety of genres available ranging from comedies, to action, kids movies, documentaries, and you’ll find classics like The Terminator, Rocky, Dirty Rotten Scoundrels, All Dogs Go To Heaven, Four Weddings and a Funeral, The Man in the Iron Mask, Hackers, Throw Momma from the Train, and even some more modern documentaries like Jiro Dreams of Sushi and Jesus Camp. The movies are free to watch, but they do display ads much like virtually every other YouTube video, but it’s still fewer commercial breaks than you’d get from watching the same movies on cable TV. Separately, YouTube has a paid movie watching service with a broader library available as well, but if you’re already an Amazon Prime or Netflix subscriber you might be less interested in another paid streaming service. We’ve embedded a few of the full movies below from YouTube, take them full screen and enjoy, or browse around what else is available on YouTube Movies free list and watch something else. Enjoy! Update: some of these free movies might be region-restricted to the USA only by YouTube, though people outside of the USA can use the free Opera VPN web browser to mimic a USA IP address if interested. If the embeds below don’t work for you to watch the movie, try watching the movies on the YouTube website instead. Feel free to post your region and watching experience in the comments below! Make some popcorn, and enjoy some of the free flicks! And if you’re not into watching movies, you can check out some check out some other YouTube tips instead. I don’t know where you are posting from, but from the Land of Freedom here in the US, they work just fine. Not dead, just geo restricted to the US. I do see a message saying that the videos were not made available in my country (Mexico) by the uploader. The movie list linked in the article text only shows previews and preorders. This type of thing is often restricted to the USA at first. If it proves viable eventually it will be expanded. But it will take months. Use Epic Browser and use Epic’s encrypted proxy for the USA – choice of East or West Coast plus other countries. I use Epic browser; no problems watching. Just click on the green/red icon (epic’s encrypted proxy) at the top right, choose East Coast or West Coast and you’re in. Tried watching from the UK. The videos aren’t available in the UK. I installed Opera Developer, and turned the VPN on. However it didn’t matter which country I selected for the VPN, it always used Ukraine. Consequently the videos are not available in the Ukraine, so no joy with this post. Anyone got any solutions please? Youtube hasn’t tried to sell it to me (in Canada) yet so it likely isn’t available in Canada. I can’t even find any information on it. I have a $10/month deal already with Youtube where I don’t see ads. I am not signed with Netflix, I would at least consider it. Apparently the free movies are only for the US. I, too, am unable to see them from Mexico. However, the lonks aren’t dead; they just have geographic restrictions according to the error message I got. The link to the youtube movie list only shows previews and preorders, but not a single free full movie. When I browsed the list of promised free movies, none was free. I wonder if that is because I am in Canada. Sure looks like it. I experienced the same connecting from Mexico. US only, it seems. Although foreign people (all of us, not just the ones trying to enter illegally) are at present completely unwelcome in the US, this type of restrictions actually has nothing to to with that. They are a result of arcane 1950s laws that are still in being applied to multimedia content. And this happens in other countries as well, not just in the US. I checked, it is about 1min30secs of the movie – what a deal !! It’s the full movie, watch it on youTube website rather than the embed. If you’re not in USA, maybe it won’t work. It works great for me but I’m in the USA! It is the same. The list on youtube only shows previews and preorders when connecting from outside the US. It’s the same, outside the US we still get the message that the content is not available in our countries even if we load the videos within youtube instead of the embed. And the list that is linke in the article show all the movies as previews or preorders instead of full movies. It’s a geo restriction based upon the ip address, so avoiding the embeds and opening in youtube instead makes no difference. I want to uninstall Plex, but when I trashes it, my computer days it can’t be done since the application is open. I can’t even figure out how to close Plex properly, as it seems! So, how do I get rid of Plex from my iMac? Nor in Mexico. All those videos seem to be US only, since I get a message saying they’re not available for my country. The movie list is all previews and preorders, no full movies free. So I am in the USA and all videos load fine, they’re all free to watch with interspersed ads every 20 minutes or so like watching TV except it’s only one commercial so much faster. I had to click outside of the website embed though and watch on youTube.com however, perhaps folks are stuck on that. Interesting! I had never heard of the Epic browser before, I was using the Opera VPN for the same purpose. Thanks for the recommendation Ben! Don’t think I will use it all the time but perfect for things like this. Can find the movies but they are not free to watch in Denmark. None of these are free. I’ve been browsing and have yet to find one that doesn’t cost to watch. All of them are free Dave, at least in the USA. I watched one earlier today. Where are you located? Maybe it is region restricted to USA? It IS georestricted to the USA. If you look at the all the messages in here, you will see that only people connecting from the US claim they are able to see the movies free whereas the rest of us outside the US have clearly said we couldn’t. Do we need more evidence? Louie, This does work – use Epic browser; no problems watching. Just click on the green/red icon (epic’s encrypted proxy) at the top right, choose East Coast or West Coast and you’re in. OK, so there are ways around it if you cannot view in your country. And it may be country specific. The above original post suggests using the Opera Developer Browser, however I could only connect to a Ukraine proxi’s from the UK, so that didn’t work. I then tried the Epic Browser. When installed from the UK it appears that you cannot select a country for your VPN, but you can use the Epic Browser default proxi which is USA East Coast. SO, USING THIS SET_UP DOES WORK, AND YOU CAN VIEW YOUR FREE VIDEOS (at least it works from the UK). Success. Steve, Open Epic, click on the green/red icon in the top right and a box will drop down giving you a choice of: East Coast USA, West Coast USA, Canada, UK, Germany, France, Netherlands, India & Singapore. All the videos just worked fine and free thanks buddy!!! « Apple Black Friday Deals from Amazon: iPads from $249, MacBook Pro $250 Off, & More!